Pluto is problematic to me. I don’t necessarily enjoy his shorts as much as the others, but I do enjoy the artistry behind them. After all, a Pluto short done well features superb animation, since his emotions have to be expressed through motion and not his voice. But when that fails, it makes for some bad stuff. Where then, do I fall on Pluto’s Fledgling? Is it one or the other? Frankly…it’s a little of both. 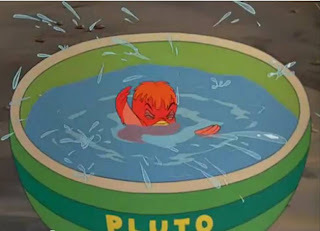 The animation of Pluto and the young bird who falls from the nest is good most of the time. Their interactions are pretty exciting and fun, and they make for some good comedy. The storytelling in this short is strong because the actions flow naturally one to the next, without a lot of exposition needed. The set up is minimal, the action is easily understood and it is funny as well. 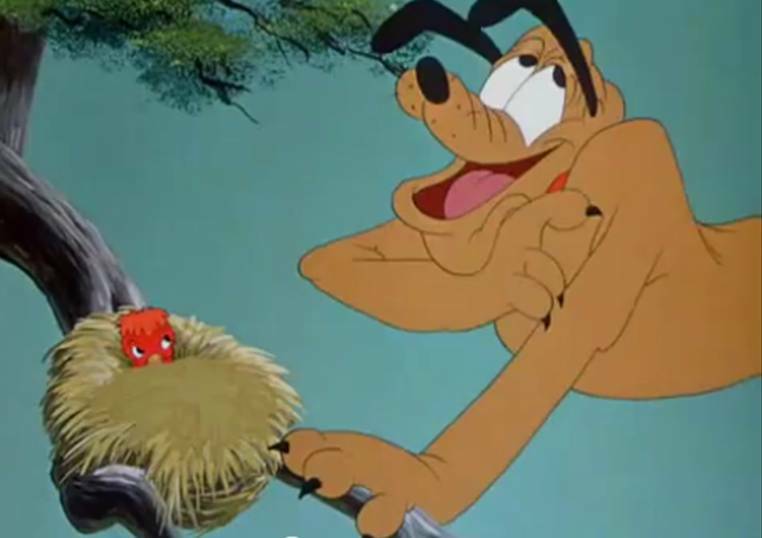 After the fledgling falls out of the nest, Pluto takes care of it, trying to get the young bird back up into the nest and out of his life. 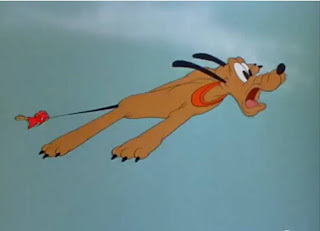 It doesn’t exactly work that way, however, since the bird falls out yet again, and Pluto realizes that he needs to get the bird to learn to fly in order to keep him from falling. To accomplish all of that without words is an achievement, and the interaction of the bird walking on Pluto’s nose and so on is quite fun to see. The next part of the short, however, where Pluto attempts to teach the youngster about flying, is not quite as enjoyable. The gags work, no doubt, but the “human” touch isn’t quite there. Pluto tries getting the bird to drag along behind him like a kite on his tail and then decides to slingshot the bird into the air. Neither works out very well, but they’re amusing enough. It seems somewhat different in tone, however, from the beginning of the short. 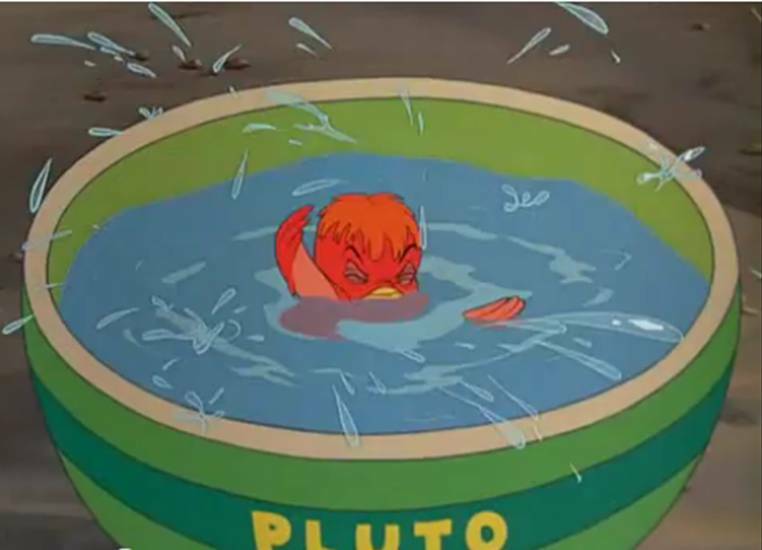 Pluto shows a motherly and concerned nature in the beginning, and switches over to a little more annoyance while going through these actions. Then, at the end, when the little guy has learned to fly, he switches back. 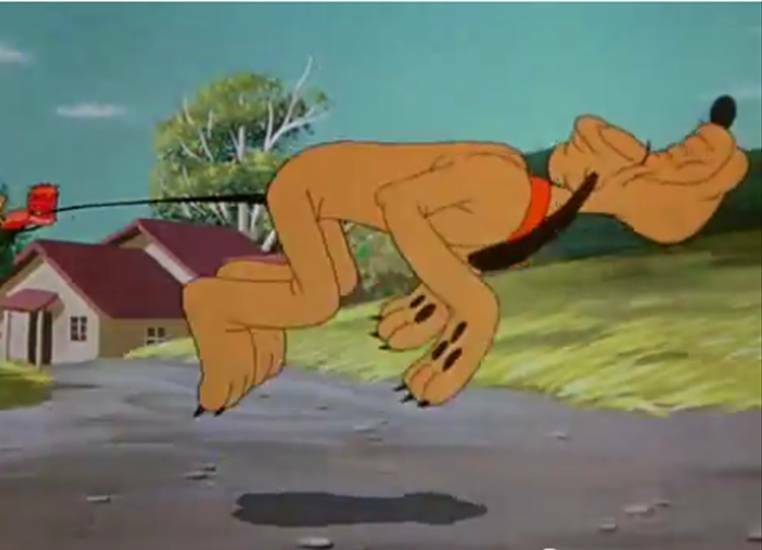 It’s that inconsistency that kept me from loving this short, but I still recommend it as a fun little Pluto gag reel.